The League is represented at the Lehigh County Naturalization Ceremonies, where we hand out a package of materials useful for new citizens. Many of these materials are described in the Services section of our Facebook page. Members are welcome to assist. Please contact email@lwvlehighcounty.org to assist. They will all be in Judge Reibman’s Courtroom (2A) in the Lehigh County Courthouse at 4:00 p.m. They are no longer being held in the Old Courthouse, and this is the first time they are being held on Wednesday. On Wednesday, March 6, 2019, 65 people from 25 countries became citizens of this great country. Judge Melissa Pavlack presided over the ceremony. In her statement to the new citizens, she spoke about the greatness of our country because of the people who emigrated from countries all over the world. She brought with her the citizenship papers of her grandparents who went through the same process to become citizens, and how grateful they were to be able to come here. The ceremony is always very emotional for anyone who attends and is open to all. There are usually four ceremonies each year. The next ceremony will be held on July 10. I will not be able to attend. Please contact me at email@lwvlehighcounty.org before June 30 if you would like to fill my role at this ceremony. Past issues of our newsletter, The Voter, featured articles written by Caryn Shoenthal about the process of naturalization. 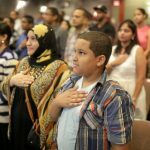 BECOMING AN AMERICAN CITIZEN THROUGH NATURALIZATION first appeared in the issue for November 2016. THE PATH TO CITIZENSHIP first appeared in the issue for February – March 2017.